Welcome to the world of DaltonLABS! A world of fun and creative visual education! 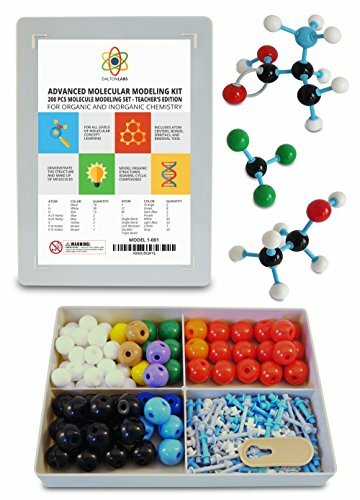 This Molecular Model Kit has a total of 200 pieces including a link remover. Super easy to build models for Organic and Inorganic Chemistry, models such as: alkanes, alkenes, alkynes, alky halides, alcohols, ethers, aldehydes, ketones, carboxylic acids, nitriles, amines, esters, aromatic compounds, heterocyclic compounds, and more. All parts are made of durable and sturdy plastic which are color coded to national standards. This is a great set for both students and teachers to aid in course studies! DaltonLABS is a proud USA family-owned business with a passion for learning! DaltonLABS uses only the highest quality materials for our products. Your satisfaction is our #1 priority, 100% guaranteed or your money back! Join the DaltonLABS World today! Add to Cart! HANDS ON EDUCATION - Models make science come to life! Use atom pieces to practice structures, cyclic compounds, empirical formula, stereoisomerism, and VSEPR theory. Explore chemistry and physics concepts. Visualize atomic structure with atoms, bonds, orbitals, and links. INCLUDES SOFTWARE AND USER GUIDE - All kits include an interactive 3d Modelling Software and a color printed User Guide with Periodic Table, providing additional study material for test and exam prep. Great for STEM teachers, high school and college level kids. FOR ALL LEVELS OF LEARNING - 200 piece sets utilize the ball and stick toys educational structure to teach students from grade 7 to the University Graduate Level. Demonstrate fundamental molecular geometry, chemical and biology structure, stereochemistry with 3D modelling studies. DURABLE, PORTABLE WITH CASE - Made from high quality materials designed for easy assembly. The pieces are color coded to national standards and all kits come with a box for easy storage and transport with your other textbooks, notes, and books. Perfect for the classroom. YOUR SATISFACTION IS GUARANTEED - Dalton Labs is a USA family-owned business. Our products are made using only the highest quality materials. We always offer a 100% No Questions Asked, Money Back Guarantee. Your satisfaction is our #1 priority. If you have any questions about this product by Dalton Labs, contact us by completing and submitting the form below. If you are looking for a specif part number, please include it with your message.